Our expertise is guaranteed. Our solutions empower. 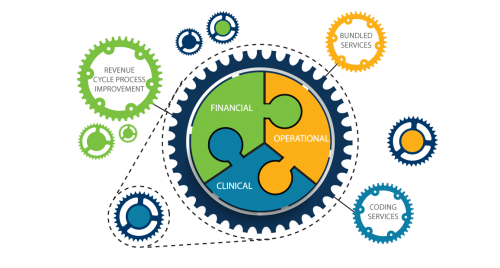 We solve financial, operational, and clinical challenges for acute and post acute providers. "We bring deep, focused expertise to address our clients’ most critical issues. What sets us apart is our ability to see the big picture, across both the industry and the entire provider organization." We have been working with McBee Associates for more than 18 years on our bundled payment initiatives. Their system tracks profit and loss on a case level and establishes meaningful benchmarks so we can easily judge the success of our program. We feel confident knowing we have experts who understand the full continuum of care on our side for the CCJR model. From staff training to full outsource, we’ve got your billing needs covered. Our account resolution specialists employ expert techniques so that you collect on difficult claims and keep cash flowing for your organization. To make the transition to bundled payments, we help you choose the right strategy, the right partners, and the right technology. With a client base that spans the continuum of care, our insight into both acute and post-acute operations will position your organization to thrive under new models. On the back end, our Bundled Payment System tracks profit and loss by case, keeping you informed on the performance of each function and partner. We help you get the patient status decision right the first time. To prevent denials and reduce the number of future appeals, our first-level reviews verify that documentation meets medical necessity criteria in real time. Whether clinical, operational or financial, our systematic, disciplined approach to compliance is tailored to your specific goals. We know that the only way to truly minimize risk is by completely engraining compliance into an organization’s culture. By identifying trends and educating staff on resolutions and best practices, we make detailed recommendations to optimize your current processes and reduce risk. We manage denials so you can focus on preventing them. We identify the root causes and craft compelling appeals that overturn denials incurred. Our case managers then provide recommendations to improve both the coding process and documentation to reduce denials over the long term. From chief financial officer to director of nursing positions, we serve in key leadership roles within finance and clinical operations across the care continuum. Our interim managers have the leadership experience to tailor their approach to your organization’s specific needs as well as the strategic vision to achieve clinical, financial, and operational goals. To ensure your hospital receives proper payment on claims subject to the PACT policy, our validation and verification processes go beyond mere confirmation in the Medicare database. We confirm information directly with post-acute care providers to provide you the highest level of accuracy and adherence to compliance standards. • We work with every major hospital information system. • Fees are fully based on contingency of payment recoveries. For optimization of your current workflows or a financial turnaround, our consultants collaborate to design lasting solutions at any stage in the revenue cycle. We deliver a full range of services that address every area from patient intake to cash posting. The result is always a strategic process improvement that works in your organization. To realize and increase your revenue stream, we analyze historical data to assess current revenue processes and measure against regulations to design a strategy unique to your organization. From reviewing payer contracts and documentation in order to re-bill claims, to performing an in-depth assessment and implementing a strategic plan to improve annual revenues, we have a holistic approach to recover and increase future revenue opportunities. We simplify the process of managing outsourced collections. Our Vendor Management System automates the tracking of outsourced collection activities, making important information about your vendors available in mere keystrokes. Our customized dashboard tracks payments and multiple collection vendors, so that duplicate payments are a worry of the past. Prevent reduced payments with a proactive strategy. Our clinicians respond to ADRs, craft winning appeals for denied claims, and review medical records to identify essential documentation needed to prevent future denials. The firm also offers pre-bill reviews with clinical feedback and recommendations for increased compliance and improved processes. From staff training to full outsource, we’ve got your billing needs covered. Our account resolution specialists employ expert techniques so that you collect on difficult claims and keep cash flowing for your organization. If you’re experiencing payment issues, we help keep the cash flowing. Our experts help eliminate backlogs and bring receivables up to date. We know the intricacies of each payer and go a step further by identifying missed revenue, correcting claims errors, and resolving problem accounts with no disruption to your organization's daily operations. On matters of clinical compliance, we make sure you know where you stand and give you the tools to improve when necessary. To maintain regulatory compliance and consistently receive correct payment, our clinical team provides quality chart audits and education on thorough clinical documentation, ADR responses, and the appeals process. To ensure your agency receives the correct reimbursement, and is fully compliant, our coding services are conducted by certified clinicians with meticulous attention to documentation detail and rigid quality standards. Transition seamlessly to a new system with support from home health and hospice experts who fully understand your need for consistent cash flow and productivity during a conversion. From project management to change management, we assist you through each step of new system implementation. From chief financial officer to director of nursing positions, we serve in key leadership roles within finance, operations, and clinical operations across the care continuum. Our interim managers have the leadership experience to tailor their approach to your organization’s specific needs as well as the strategic vision to achieve clinical, financial, and operational goals. To maximize partnerships with referral sources and make performance improvement decisions, our consultants provide a full assessment of market factors, quality measures, resident satisfaction, and regulatory compliance to secure prime positioning in the continuum of care. Our evidence-based solutions range from strategic planning to compliance strategies aimed at increasing referral conversion, improving the patient experience, and building sustainable network relationships. Our proven strategic processes will help your organization manage the transition of care requirements. After performing an assessment, we help you create a sustainable management model that not only meets payer criteria and reduces unnecessary costs but improves patient outcomes. With our clinical recommendations and approach to education, you’ll experience sustainable results throughout your organization and be the go-to for provider referrals. If you’re experiencing payment issues, we keep the cash flowing. Our experts help eliminate backlogs and bring receivables up to date. We know the intricacies of each payer and go a step further by identifying missed revenue, correcting claims errors, and resolving problem accounts with no disruption to your organization's daily operations. To ensure your agency receives the correct reimbursement, and is fully compliant, our concurrent OASIS and coding services are conducted by certified clinicians with meticulous attention to documentation detail and rigid quality standards. We make sure high care quality and financial viability are within your reach. Our approach to episode management improves the delivery of the patient's plan of care. Our clinical teams partner with yours to develop custom care guidelines that reduce readmissions, improve visit utilization, and provide patients with a positive outcome. Patients, and referring providers, will count on your agency for the best care and patient experience. Our comprehensive Impact Analysis helps you forecast the financial effects that your agency can expect under the proposed regulations by repricing your claims using the Patient-Driven Groupings Model (PDGM) for reimbursement. Armed with this information, you’ll be able to anticipate the impact in order to forecast, plan, and budget for 2020. For the most thorough review on each chart, we evaluate OASIS responses and coding decisions using all available documentation. You achieve the best clinical and financial outcomes possible by optimizing your OASIS process with a focus on compliance and nuances of proper OASIS completion. Contact us for a free 45 minute demonstration. To prevent financial risks associated with underpayments and overpayments, we help you receive accurate reimbursement for paid Medicare claims and engrain compliant practices to protect your bottom line. Our revenue recovery process is built to handle every step from claim review to payment verification. All consultants, from junior staff to senior management, know health care policy at a granular level, and stay ahead of all compliance issues that could impact clients. Compliance with health care policy and regulations is an integral part of all phases of client engagements and the firm’s internal training processes. McBee helps clients establish, update, and review compliance programs. The firm’s compliance expertise is also utilized internally by maintaining an active compliance program that includes training, risk assessment, extensive review of high-risk engagements, and self-audits. McBee believes that compliance is essential to good business.